This recipe started out being a baked french toast recipe, but I have tried baked french toast before, and neither my husband nor I liked it, so I was hesitant to try it again. Instead, I decided to put all the goodies inside the bread instead, and then cook it like normal french toast. The results were delicious!!! My husband rarely requests anything special for breakfast, but this one made the request list. The blueberries can be substituted for Strawberries, Raspberries, Peaches or any other fruit your heart desires! Start by making the blueberry sauce. Combine all the ingredients in a sauce pan and bring to a boil, stirring constantly. Reduce heat to a low simmer, and continue to stir constantly. Simmer for about 2-3 minutes. Combine the softened cream cheese with 1/2 cup of the blueberry sauce and mix thoroughly. Spread this mixture onto each piece of Texas toast. Press two pieces firmly together, with the filling inside the pieces, to ensure they stick, but without pushing the filling out. Mix eggs, milk, vanilla, cinnamon and salt in a bowl. Dip the bread into the egg mixture and place on griddle. Cook till golden brown and then flip the toast to the other side. Spread a little butter on the tops of each piece of toast. When the bottom side is also browned, remove from griddle and serve on a plate topped with additional Blueberry Sauce. 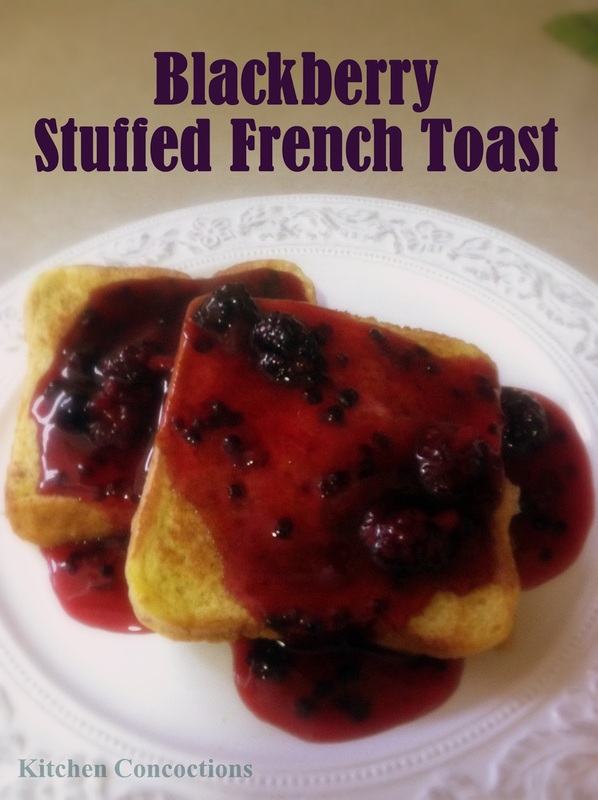 This is the Stuffed French Toast we tried with Blackberry filling and sauce. Yummy! Another variation is PB Banana Stuffed French Toast! Do you think this would work overnight in a crock pot? I think if you did it the same way as a baked french toast it might work. With baked french toast you use 1″ cubes of bread and pour your egg/milk mixture over top. 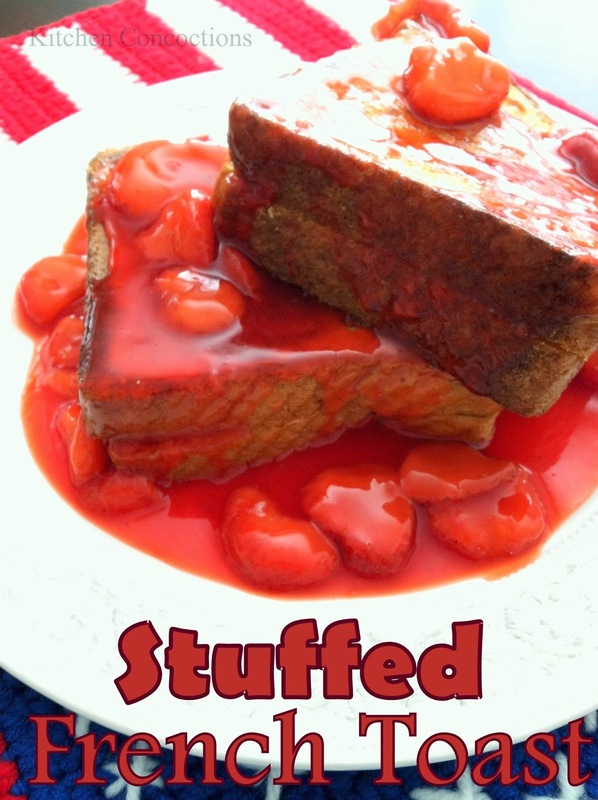 For a “stuffed” version, you would use small chunks or cubes of cream cheese as well as adding your berries or other toppings. Maybe try it in the crock pot on low for 6 hours… or until the eggs are done, then pour your berry sauce on top when it is done.